An 11-year-old orphan, discovered working in a maharajah’s stables by a cameraman on a scouting trip, represents one of the strangest anomalies in the history of movie-stardom. Osmond Borradaile was in India in preparation for a project based on a story by Rudyard Kipling when he met Selar Shaik and brought him to the attention of producer Alexander Korda. 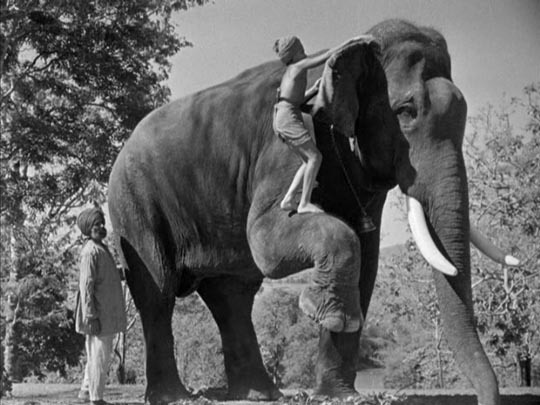 The film, an odd collaboration between Korda and ethnographic documentarian Robert Flaherty, was Elephant Boy and the fact that Shaik was in fact an elephant handler was an obvious advantage. But it was the boy’s undeniable natural charm, the complete lack of affectation which so often plagues child actors, that made him an unlikely star. Taking the name Sabu, that boy made a series of increasingly elaborate movies for Korda over the next few years, moving to England where he gained an education and became a celebrity. 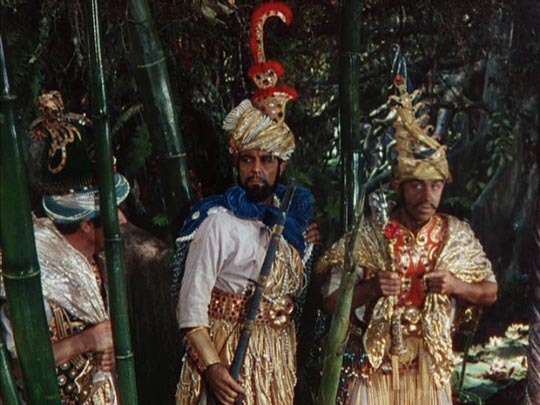 His popularity made him attractive to Hollywood and even if the war hadn’t forced Korda to move production of The Thief of Bagdad (1940) to the States, Sabu no doubt would have arrived there eventually anyway. And yet, after his final film for Korda, Sabu spent the rest of his career mostly in exotic B-movie programmers. Apart from appearing in Michael Powell and Emeric Pressburger’s Black Narcissus (1947), he never again achieved the level of those early roles. Perhaps this had more than a little to do with his persona being embedded in the ethos of the British Empire, something Hollywood was not equipped to emulate. Criterion’s recent Eclipse set Sabu! is an excellent companion to their fine edition of The Thief of Bagdad, the three films it contains illuminating the evolution of this unusual star as well as Hungarian ex-pat Korda’s evolving treatment of Empire. 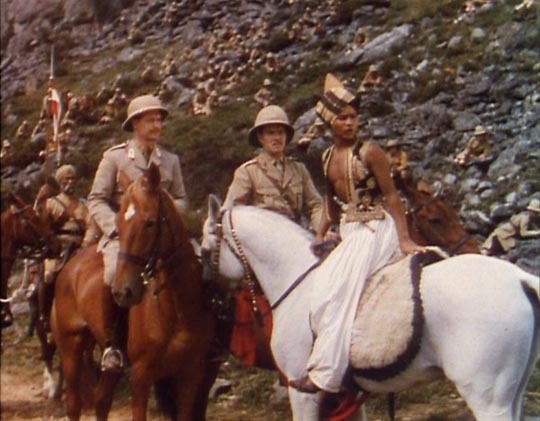 Sabu’s debut film is a surprisingly successful hybrid, combining Flaherty’s documentary observation with Zoltan Korda’s storytelling to convey a child’s eye view of life in Imperial India. Toomai, like his father and grandfather before him, is a mahout who works with a magnificent elephant which has been in the family for years. The boy has ambitions to become a great hunter, but is mocked by the village men for his youth and naivete. When Petersen (Walter Hudd), the government’s official hunter, puts together an expedition to track wild elephants, the boy charms the Englishman and is allowed to accompany his father on the trek. The expedition is a debacle; no sign of wild elephants for weeks on end. Petersen is ready to give up in despair when a tiger attacks and kills Toomai’s father. Enraged by this loss, the family elephant is now seen as a danger, and the other elephant handlers insist that he must be shot. 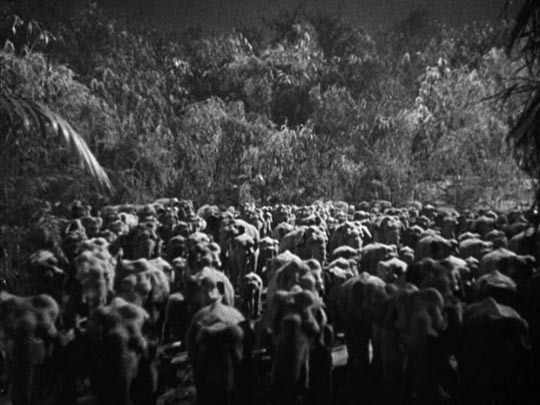 But Toomai escapes with the animal during the night and heads into the jungle. As Petersen and the others search for him, Toomai finally comes across the wild herd and, in the moonlight, sees the elephants “dance” – a mythic event which the other men had mockingly said he must witness before he could become a hunter. Needless to say, Toomai is hailed as a hero for leading the expedition to the herd and is hailed as the greatest hunter of all. The story is essentially a fairytale in which a mocked and misunderstood child proves his worth and becomes a prince … but it’s told with a striking documentary eye. The footage of the elephants at work is fascinating, and the observation of the mutually dependent lives of the villagers and the animals gives the underlying narrative fantasy a grounding in reality. Added to this is Sabu’s natural charm which infuses the proceedings with an engaging emotional dimension, made even more remarkable by the fact that he didn’t speak English and had to learn all his dialogue phonetically. The film has an unquestioned deference to the British authorities, with Petersen showing greater understanding and sympathy towards the boy than he receives from his own countrymen, whose superstitions threaten everything that’s important to him. The surprising success of Elephant Boy virtually guaranteed that Alexander Korda would have to follow it up quickly with another vehicle for his child star. The Drum is a bigger, more spectacular movie, but it relegates Sabu to a much smaller role, almost as if the producer wasn’t willing to entrust the increased resources to the young actor. The Drum is like a trial run for the next year’s The Four Feathers (both were based on A.E.W. Mason stories). Sabu is Prince Azim, son of the ruler of a kingdom on the Northwest frontier. When his father pledges allegiance to the Raj, his uncle Prince Ghul (Raymond Massey) murders his brother and plans an uprising to drive the British out. 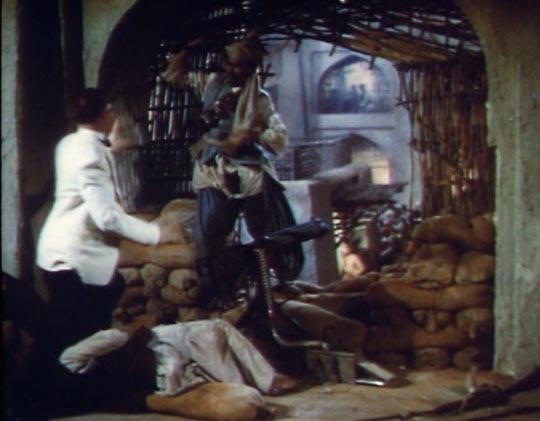 Loyal retainers manage to get Prince Azim into hiding and he eventually makes contact with the friendly Captain Carruthers (Roger Livesey) and his wife (Valerie Hobson). Carruthers is sent as British representative to the court of Prince Ghul, where he must uncover the new ruler’s plans and safeguard British power. 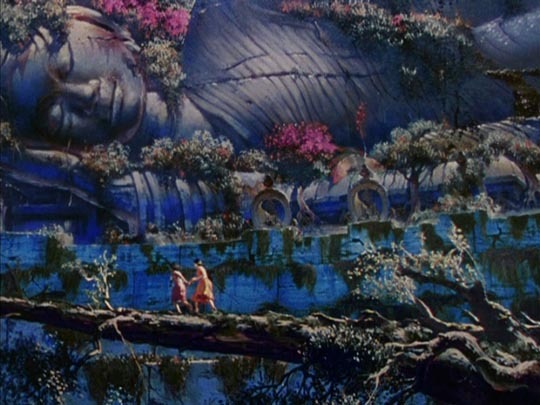 Sabu disappears from the film for long stretches as it concentrates on the larger story, but in the end it’s the young prince who manages to tip the scales when the uprising begins, giving Carruthers a timely warning which prevents an all-out massacre of the garrison. Zoltan Korda directs with the same flair for exotic locales and large-scale action which marked The Four Feathers, but here, just a year earlier, there’s no sign of the ambivalence towards the Empire which problematized the later film. Here, the British are decent, noble, peace-loving bringers of civilization to the wild places of the world, while the rebellious natives are presented as murderous religious fanatics. Apparently this unquestioning deference to the Raj resulted in riots in some theatres in India where it was shown, and the enthusiastic endorsement of British rule exhibited by Sabu’s Prince Azim offended Indian nationalists. 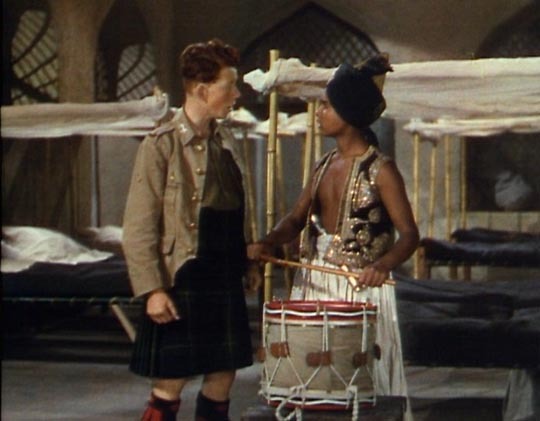 While his role here is much smaller than in Elephant Boy, Sabu exhibits the same charm and enthusiasm and when set next to Bill Holder, the regimental drummer boy who becomes his friend, his naturalness stands out in sharp contrast to the fussy “acting” of Desmond Tester. 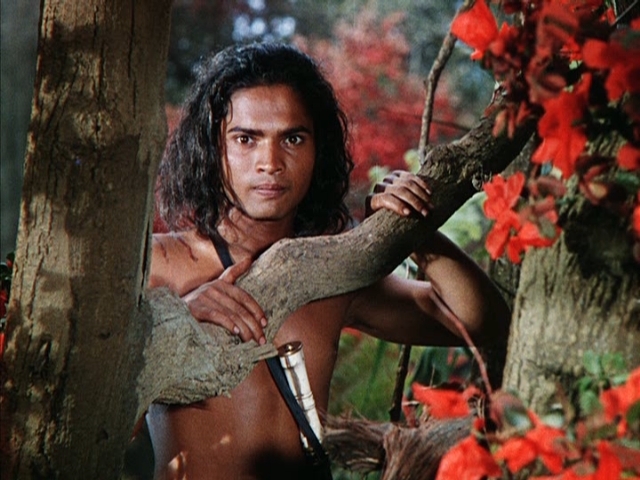 After The Drum, Korda moved Sabu away from the “real” India of the Raj and their final two films together were both fantasies, first The Thief of Bagdad, and finally an adaptation of Kipling’s Mowgli stories. 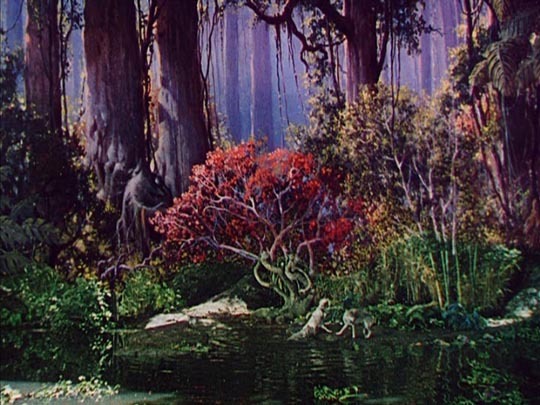 Jungle Book is set deep in a fantasy world which is not specifically any recognizable country, although there are elements of India and other parts of Asia. A baby (his father once again killed by a tiger) wanders away from his village and is nurtured by wolves who name him Mowgli, growing up in harmony with the animal world, where every creature is a friend … except for the tiger Shere Khan. 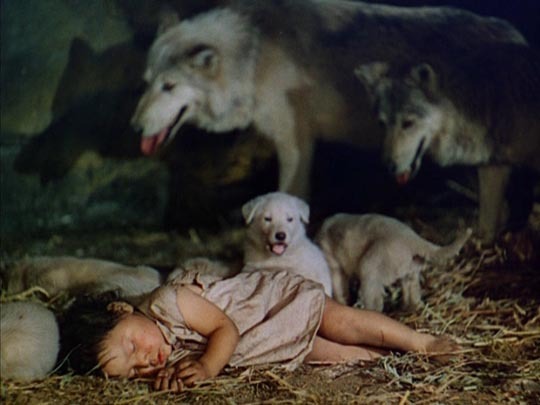 Years later, he finds his way back to the village where he’s recognized as a wolf boy, though initially his mother Messua (Rosemary De Camp) can’t believe he really is her son. Nonetheless, she takes him in, while the elder Buldeo (Joseph Calleia) is openly hostile, seeing the boy as a threat to the community. But Buldeo’s daughter Mahala (Patricia O’Rourke) is drawn to Mowgli, and one night follows him into the jungle. They find the mystical ruins of an ancient city beneath which is a vast treasure chamber guarded by an old, toothless cobra who warns them that the treasure is death. But Mowgli lets Mahala take one gold coin as a souvenir. When her father discovers the coin, he and his two cronies, a priest and a barber, set out to discover the treasure for themselves. 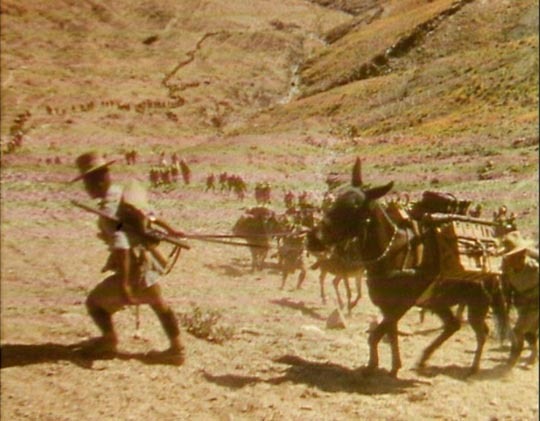 Here the film takes a Treasure of the Sierra Madre tack, with the three men sinking deeper into madness as greed takes control of them. They find the treasure, but fight among themselves. 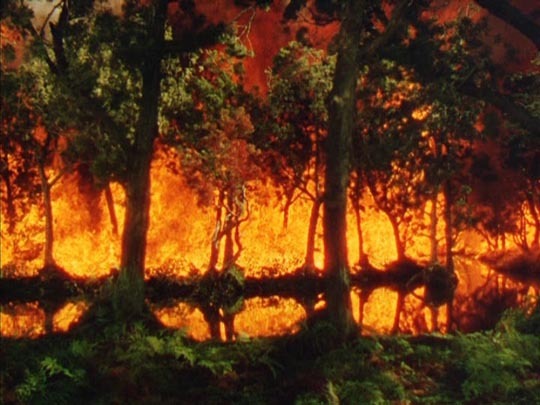 When Buldeo returns alone, he accuses Mowgli of the killings and, in his madness, sets fire to the forest to burn the boy out. 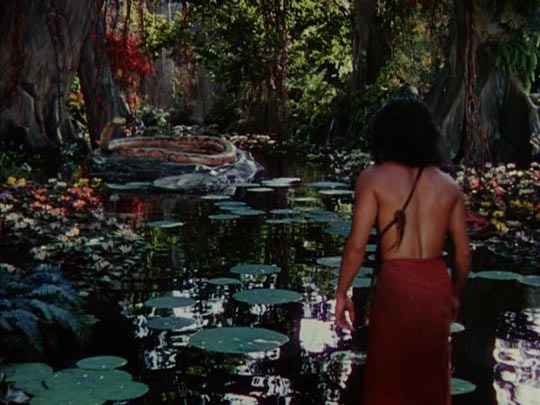 Mowgli helps the villagers to safety as the fire destroys the community, but in the end, having witnessed the madness of men, he chooses to return to the jungle and the community of the animals. Sabu was seventeen when he made Jungle Book and his growing maturity is reflected in a darker tone. Perhaps life in Hollywood had given him insights into human behaviour comparable to the lessons learned by Mowgli during the course of the film. The openness of the earlier films has become more guarded here. As a performer, he retains his charm, but he’s no longer a child. This entry was posted in Review and tagged Actors, Adventure Films, Alexander Korda, Criterion, Directors, Eclipse, Fantasy, Sabu, Zoltan Korda. Bookmark the permalink.